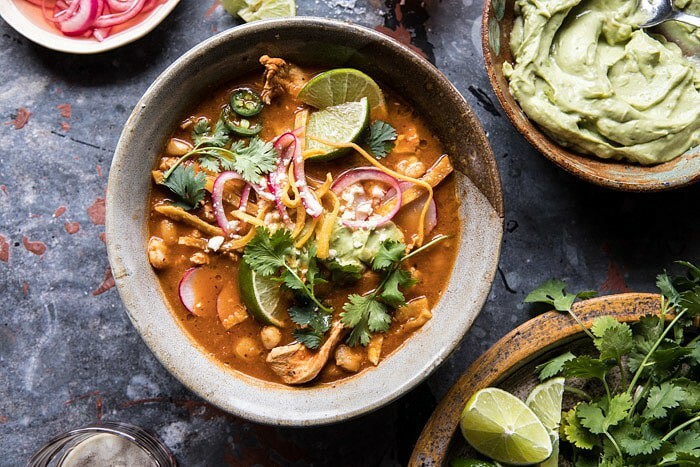 Mexican Hot Pot with Avocado Crema. 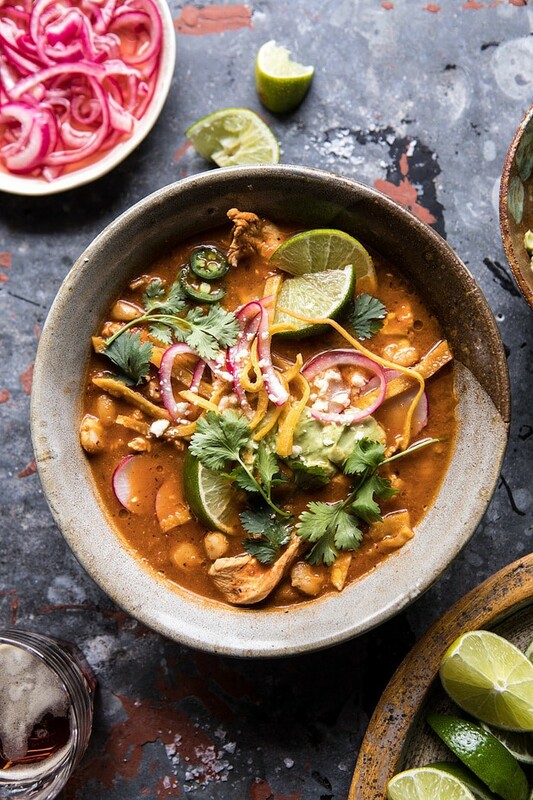 Having some fun today with this Mexican Hot Pot with Avocado Crema. Have you guys ever had hot pot? I am personally fairly new to the concept, but after making my first Pho a few weeks back, I was hooked on the idea. In fact, according to the experts at McCormick Hot Pot is one of the key trends in their 2018 Flavor Forecast! If you’re too are new to the concept, hot pot is traditionally a Chinese soup consisting of simmering Asian flavored broth that’s served at the dinner table. While the broth simmers, you add different ingredients like meats and veggies to the hot broth, which cook up right at the table. The broth is usually ladled over noodles, like in a classic Pho recipe. I think of Hot Pot kind of like the soup version of fondue. It’s a really fun dish to entertain with, and allows for guests to customize their own bowls of soup. 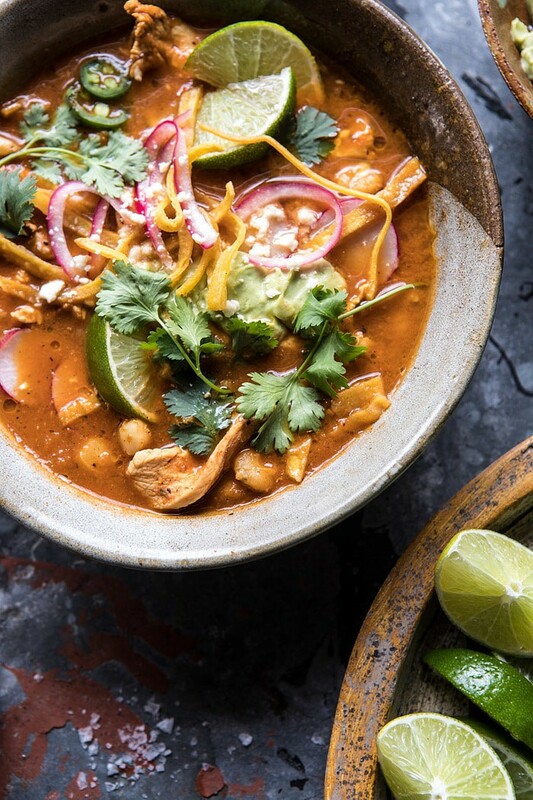 We’ve been having a lot of really cold, wintery days here in Colorado, and I have been craving the warm, spicy flavors of Mexican based soups. I was inspired by the idea of Hot Pot, but wanted to create a Mexican version and I am so excited to tell you guys about it! My first try was made a few weeks ago, when we had a lot of people in town. I thought it would fun to have everyone serve themselves and create their own bowls of soup. It was such a hit that I knew I had to perfect the recipe a bit and then share it with you guys. So happy that I finally got everything just right, because this is the perfect winter recipe for a fun night in by the fire with friends and family. Start out by making the broth. 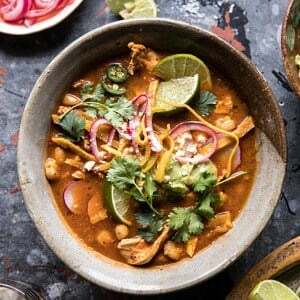 I decided to go with a spicy tomatillo and tomato based broth with flavors inspired by a classic Pozole using Kitchen Basics Chicken stock for a rich base flavor. 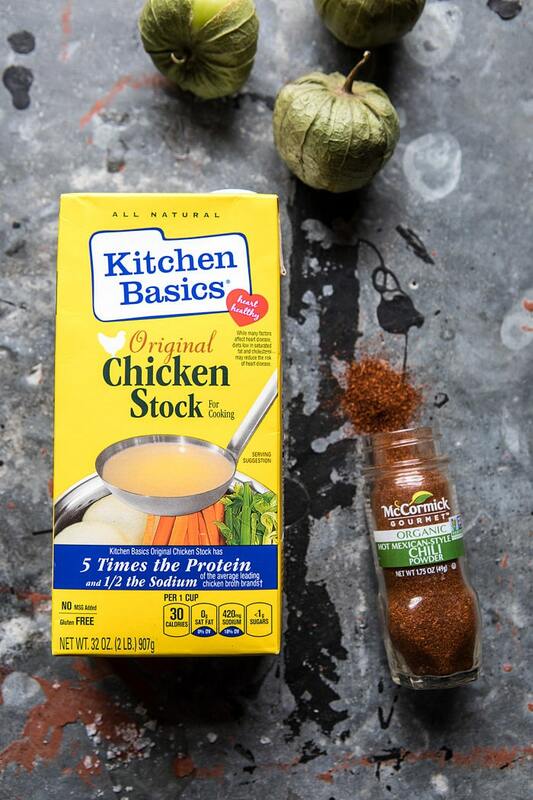 It’s very simple, but super flavorful. Once the broth is made, it’s time to prepare your add-ins and toppings. These are the most import part of your hot pot, so make sure you have plenty to choose from. I used very thinly sliced chicken breast and hominy for my add-ins. The idea is that you add these to the simmering broth just before ladling the soup into your bowls. Of course you want to make sure the chicken is cooked through before serving, but that should take around three to five minutes. You can also choose to add rice to your bowls before adding the broth…you know me, I of course added some rice. Then once you have your broth ready, it’s time for toppings. Here are my suggestions. homemade avocado crema, actually this is a must. The toppings are where you can really have some fun and be creative using ingredients you love! 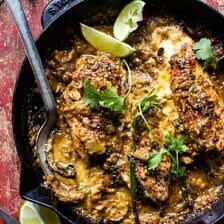 As I mentioned, this is the perfect dish to serve a crowd, but could also be a fun dinner for two. Either way you serve it up, it’s going to be delicious. I’ve already decided that my next Hot Pot recipe is going to be a Korean hot pot! Totally doing this once we return home from Korea, I cannot wait to get some inspiration there. 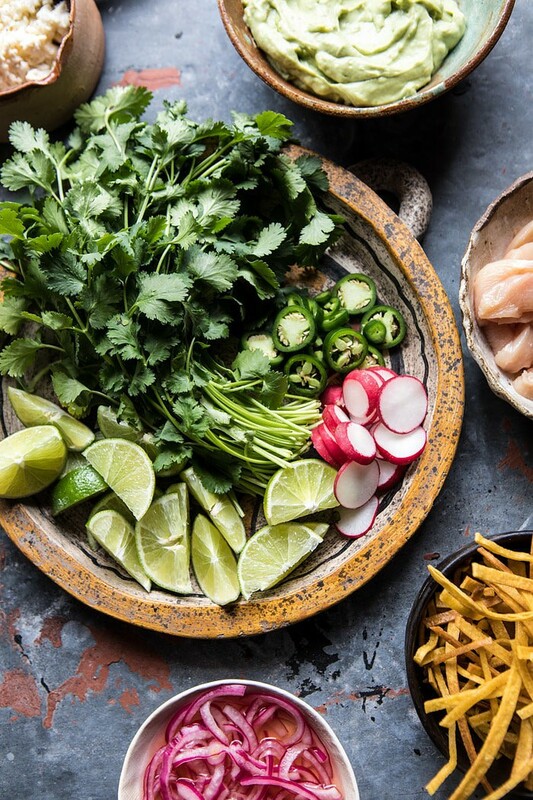 Until then, you guys have to try out this Mexican inspired Hot Pot. Oh, and if you’re looking for even more hot pot inspiration, be sure to check out the recipes below. Traditionally hot pot is a Chinese soup consisting of simmering Asian flavored broth served at the dinner table. While the broth simmers, add different ingredients like meats and veggies, which cook up right at the table. This is my Mexican version! 1. Preheat the broiler to high. 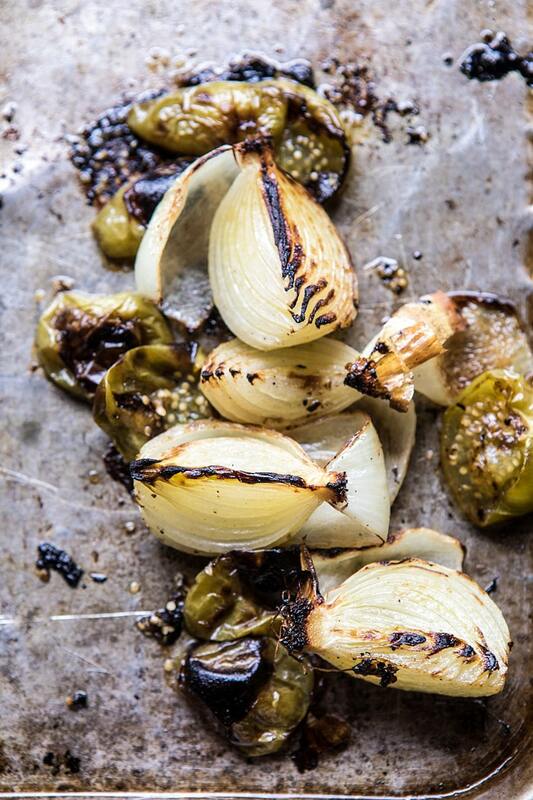 On a baking sheet, toss together the olive oil, tomatillos, onion, and garlic. Transfer to the oven and broil 3-5 minutes or until charred. Remove the skins from the garlic. Add everything to a blender. Add the tomatoes and puree until smooth. 3. Set a large pot over medium heat. Add the tomato puree, chicken stock, chili powder, cumin, and oregano. Season with salt and pepper. Bring the broth to a boil, then reduce the heat to low and simmer 15-20 minutes. 4. Meanwhile, make the crema. Combine all ingredients in a food processor and pulse until smooth. Season with salt. 5. Arrange the chicken in a bowl. Set your toppings out in separate bowls. 6. 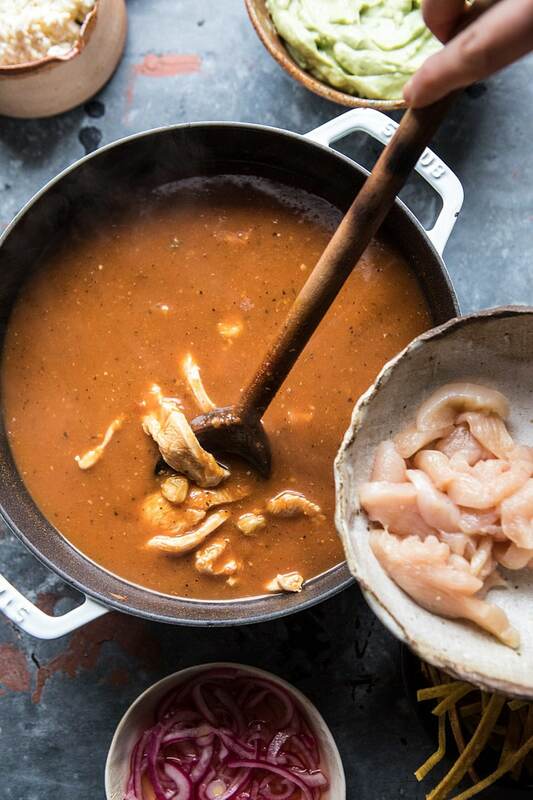 When ready to serve, add the chicken and hominy to the broth and cook 5 minutes or until the chicken is cooked through. Add rice to bowls, if using. Ladle the chicken and broth over the rice. Have everyone top each bowl as desired. As a gal who has lived in South Korea for nearly a decade, stock up on gochu chili powder, gochujang paste (they are both very different, yet essential, and you’ll never find a true substitute abroad), dwanjeong paste, ssamjang paste, and buy all the crazy snacks you see (I promise, even if they sound weird, go for it! Go nuts any convenience store!! It’s cheap, and you have nothing to lose!!) Also, Korean Ramyeon is leaps and bounds better than any ramen you’ve ever had as well!! Enjoy!!! Ah thank you so much for this! I cannot wait to try everything there! This looks delicious! Adding it to the menu now! 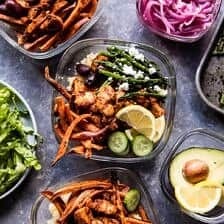 What other veggies do you recommend throwing in??? I am on a serious veggie kick and need all the greens! You’re introducing me to something new Tieghan. I’ve never heard of hot pot, but it’s looking pretty good! Perfect warm up of a meal. Just read the great article about your brother, Red, and the whole family in the Denver paper. How exciting for everyone! Thank you Kathy! I am super proud of him! That looks super delicious Teighan. Your food is always so tempting. Marking it to make later. 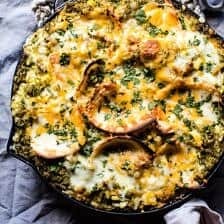 I’m totally in love with this recipe! This was great Tieghan! As always, love your recipes. For subs: since there were no tomatillos in sight, I added a scant 3/4 cup salsa verde to the blender (lowest sodium salsa verde I could find). It worked like a charm. I also used thinly sliced flank steak (seared on a cast iron grill pan) instead of chicken. But everything else was the same and it was awesome! Keep it up; we love HBH. Thank you so much Leanne! I am so glad you enjoyed this and hope you love some others on my blog! I would love to cozy up with a bowl of this! YUM! I agree – this is so fun for entertaining with! Looks so warm and delicious! 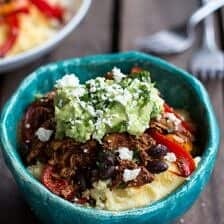 This looks so delicious, love the flavors and the avocado crema! 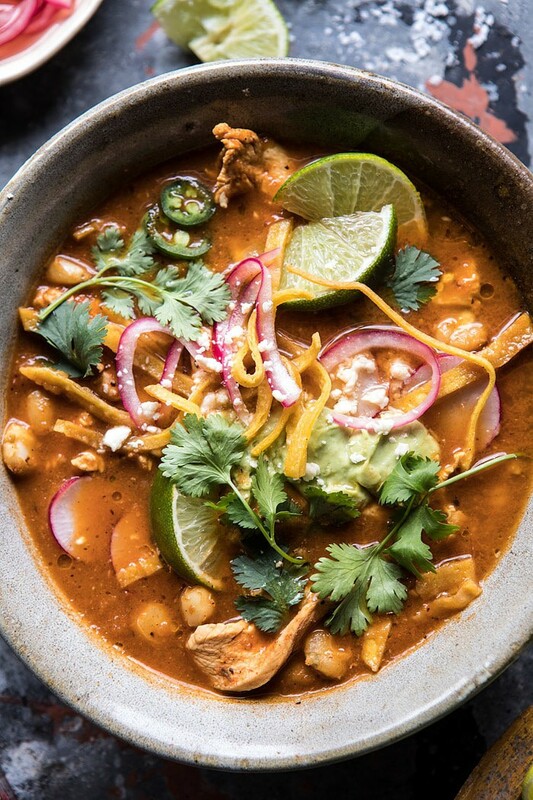 I appreciate what you’re doing here and I’m sure it’s really good, but this is literally just posole. This looks delicious. I’m definitely going to try this with my family. Thanks! I hope you and your family loves this! Thanks Elle! I was so excited to try this, then realised that I can’t get tomatillos or hominy here in New Zealand. I don’t think I can get queso fresco either. 🙁 I’ll have to experiment and see if I can come up with a version using available ingredients here. I do love a challenge. Ha ha! I hope this turns out amazing for you! Let me know 😊 Thanks Elle! I made this last night and it was delicious! The crema is so easy and so good – I’ll definitely use it alone for other dishes in the future. I love the texture that the hominy adds. I followed the recipe precisely but added the juice of one lime to the soup itself vs. using as a garnish as I love the acidity and tanginess of lime. We’re not vegetarian but I easily made it vegetarian using Quorn faux chicken chunks and vegetable stock. Sorry to complain, as I really loved the dish as did my husband – it will be a repeater! I’ve enjoyed several of your recipes so keep them coming. Thank you so much Erica! I am so glad you loved this and I will try to modify for you! Really glad you liked this! This looks so delicious! But I can’t get hominy here in the UK, would it work ok left out? – I’d definitely add the rice.